There are a few of us chicken bloggers/writers who met years ago and have become the “chicken-ladies of the Northeast.” We keep in touch and each year we meet at the Northeastern Poultry Congress to give hugs and catch up on all things chicken. I adore these friends. One of these chicken ladies is Melissa Caughey of the popular blog Tilly’s Nest. Melissa has just come out with her first chicken book: A Kid’s Guide to Keeping Chickens and it’s a winner. In it she offers advice on how to choose chickens for your flock, how to take care of those little chicks for the first six weeks, building a coop, feeding your flock, eggs, how to take care of sick chickens, playing with chickens, and the final chapters cover chicken crafts and cooking with eggs. It’s all here inside the covers of this book. Everything you need to know in order to raise backyard chickens. I know that there are a lot of chicken books out there and I usually tell people in my chicken workshops that once they have a good one, they don’t really need another, but Melissa’s book goes so far beyond being “just” a chicken book, it’s an entertaining and informative resource that quite frankly belongs in everyone’s chicken book library. 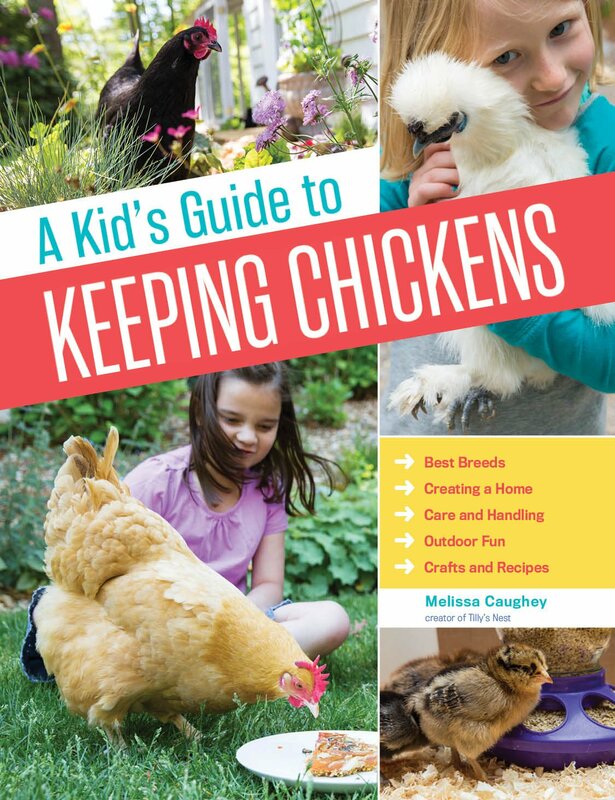 If you’re getting chicks this spring, also consider picking up a copy of A Kid’s Guide to Keeping Chickens – you’ll be doing yourself and your flock a big favor. Nice job on this and on the obit that apparently came out today. See you this weekend. Start the journey tomorrow morning, so am organizing todayboth at work to leave early, and so that I can bring clothes, blanket, pillow, food and stuff on the train as carryon. Like camping a bit.